Lauren was 7 today. We had a special dinner with Lauren’s favourite food of thin meat tacos and fresh buttered corn. But dessert was almost a problem. Lauren wanted a white vanilla cake. Her sister Rebecca was the one who baked the cake and she was keen in putting some Bonne Maman raspberry jam to make it pink. There was an altercation involving crying and shouting but in the end Lauren accepted a pink cake. Rosemary had asked Rebecca to bring her digital camera to take pictures of the blowing of the candles. I insisted in using my large camera and light. This went against the grain of Rebecca who wanted the traditional walking into the room with the lit cake while all of us would have been singing happy birthday. My lights and camera make it difficult to be spontaneous. I like to shoot it all planned, posed and calculated. I understand more than ever this conundrum as I and my photographic style fade into obsolescence. We did it both ways and Rebecca got her picture to show her father Bruce who could not be present. He was working. And of course I must wait until Monday noon before I can have my transparency film processed. That is why this blog has no record of the candle blowing. It was on Friday of last week when Rebecca was still in school that I went to her potted rose garden and cut some of her roses and scanned them. I projected them to Rebecca’s surprise at our joint lecture, A Rose Through a Child’s Eyes, at the World Rose Convention last week. I think that Rebecca’s roses are beautiful. The yellow one on the right is Mrs. Oakley Fisher. 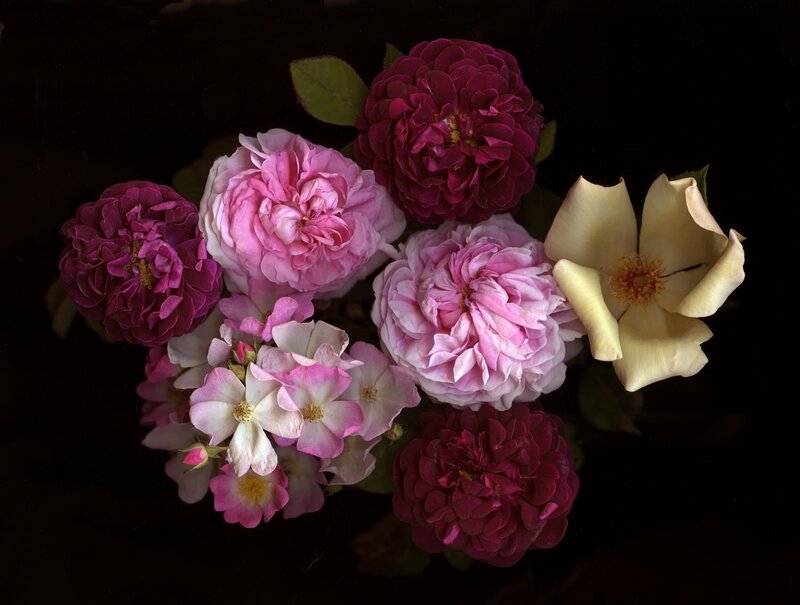 The two large pink ones are Rosa 'Königin von Dänemark', the deep red ones are a Gallica Rose, Tuscany Superb and the spray of roses is Ballerina. I do believe she has good taste. As we left to take them home I noticed the rainbow outside. When we were getting close to their home I said, “It seems that the rainbow is starting at your house.” Rebecca then asked, “Papi, would you like a rose with the colours of the rainbow? I would not like it.” “As a matter of fact,” I answered, “there is a miniature rose called Rainbow’s End which is multi coloured.” Both Rebecca and I concurred that such a rose would never grace our gardens. Lauren then asked, “Papi is that rainbow far?” “It is very far,” I answered. Lauren then said, “But not as far as Mexico?” Lauren, Rebecca and Rosemary are going to Los Cabos in Baja California in August so Mexico is in Lauren’s mind these days. 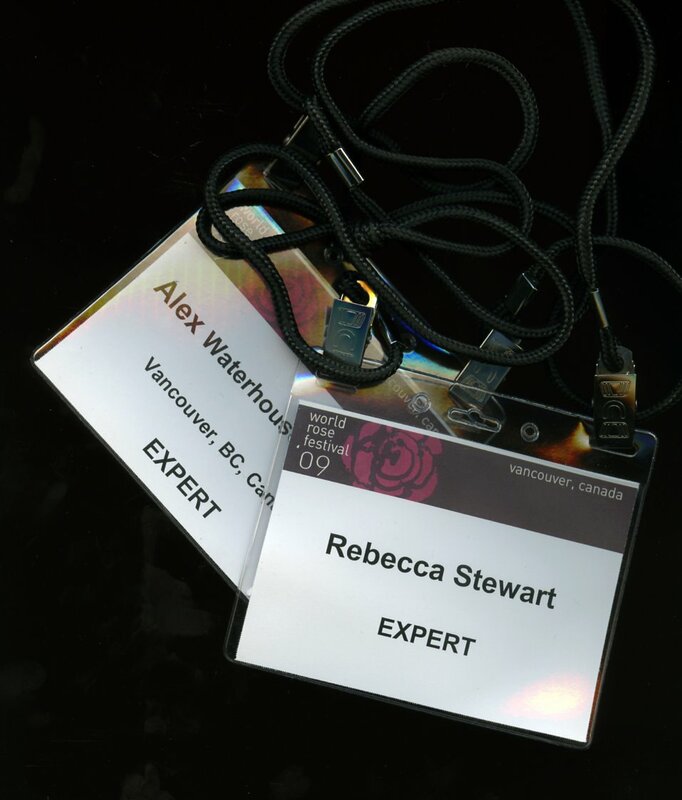 Last week Rebecca and I spoke in three one-hour sessions (Friday, Saturday and Sunday) at the World Rose Festival that was held at the new Vancouver Convention Centre. Both of us had these tags hanging from our necks that defined us as experts. 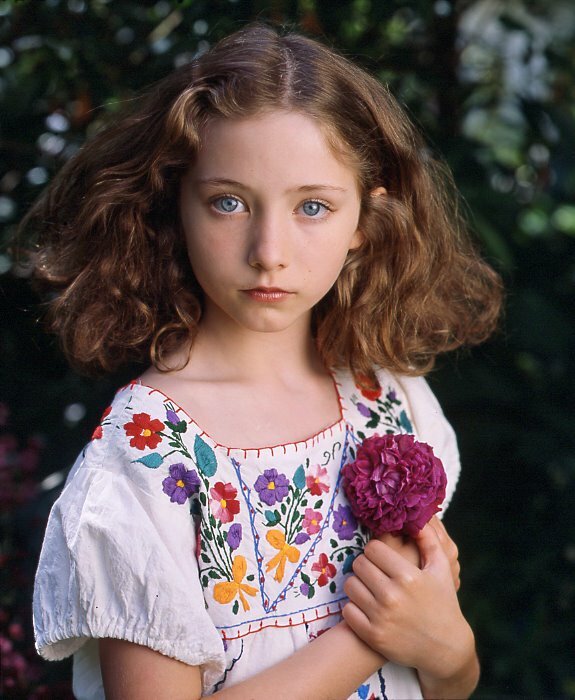 The theme of the lecture was A rose through a child's eyes. Rebecca exceeded my expectations on how she was going to perform. As a matter of fact I asked her, "Aren't you going to be nervous facing all those people?" She answered something like, "That's not going to happen." On the second day we were preceded by the legendary English rose expert Peter Beales. "Aren't you nervous that we are going to speak after him? " Her reply was a a flat, "No." 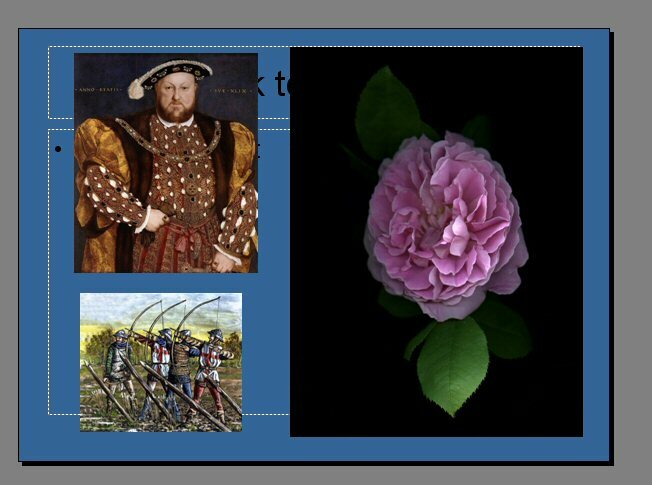 When these images appeared on the screen Rebecca said,"This rose is an English Rose called Mary Rose. 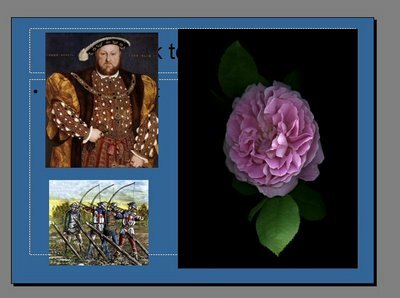 Mary Rose was Henry VIII's flagship. She sank on her maiden voyage. Not too long ago they found the wreck. Inside were boxes and boxes of long bows. They put strings on them and they found that one needed a pull of 100 lbs. These English bows defeated the French knights three times during the Hundred Years War. These bows were made of Taxus or English Yew. 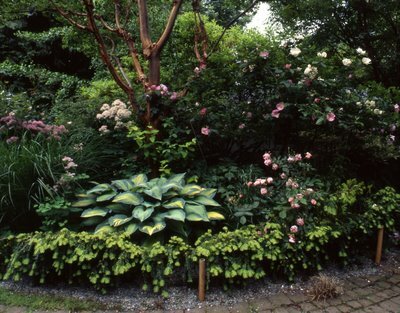 The plant in the bottom of this picture which is in my grandfather's garden is a taxus." She, of course, blew them away with erudition! The president of the Toronto Rose Society invited Rebecca to lecture (with an honararium, of course!) if she ever goes to Toronto. And of course, I was most proud. And prouder still when the venerable Peter Beales came up to me and said, "I was impressed by Rebecca." …He felt a grave drowsiness. The horse [Traveler] nuzzled his ear; he smiled and rubbed the delicate nostrils. Then he began to drift off. He should go into bed now, but he was not comfortable lying down; he could not breathe. It was better to sit in the night alone with the beautiful horse standing guard above him. 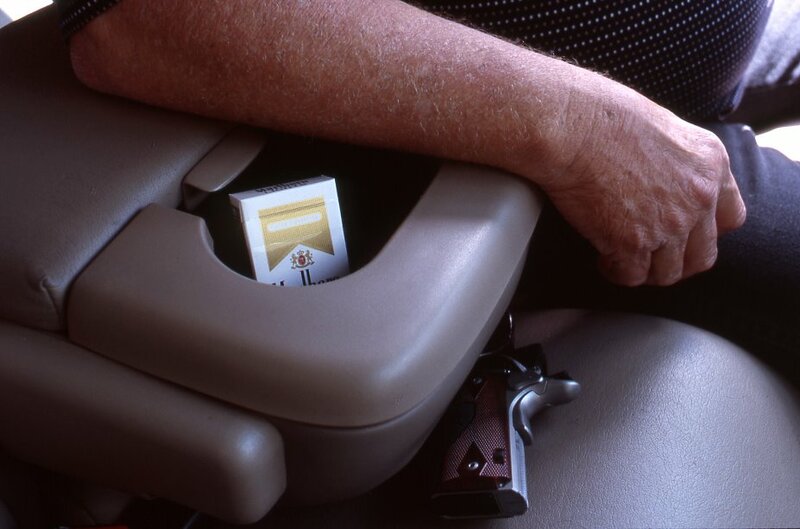 It was not so bad to be an old man, drifting. Soon to see the Light. He wondered what it would be like to enter the Presence. They said there would be a fierce blinding light. How could they know, any of them? He wondered: Do you see all the old friends? At what age will they be? Will I see my father? I had been unaware of this cemetery back in 1961 when I graduated from St. Edward’s High School. It was in that year that all my teachers, Brothers of the Holy Cross, where all alive. They were there at our graduation. 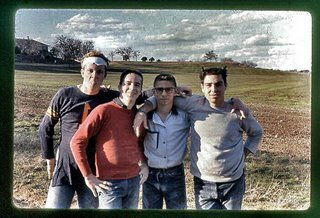 I never saw any of them again with the exception of Brother Edwin whom I visited with Rosemary and Rebecca two years ago. I had further found out that all of my teachers with the exception of a very few (Brother Edwin) had all died, some like Brother Francis Barrett at a young age but most of them in their 80s and 90s. I asked Brother Edwin to take me to the cemetery. The Congregation of Holy Cross has a separate little corner in the Catholic cemetery. There are some nuns and priests but the bulk of the graves are brothers. My beloved Brother Hubert Koeppen has a cross but it said Notre Dame. He is buried in a cemetery that must be adjacent to Notre Dame in Indiana. I asked Brother Edwin where he was going to be buried. His answer had all to do and depending when he died. It could be in one corner or another. If someone preceded him that corner would be taken. I took his portrait and soon I was overcome by a bitter sweet nostalgia for all the brothers who had made me be the man I am today. I felt myself smiling and I could not figure out why. It has occurred to me in retrospect why I did so. I can answer Robert E. Lee’s question about heaven. His friends will all be there as mine were that morning at the Assumption Cemetery just like I last remembered them (or as Lee would remember them) in 1961. All at their prime. My classmates tried to find the cemetery later that day but were unable to locate it. They convinced me to accompany them and show them the way. I returned and watched them in silence as they walked from one grave to the next. I had seen the brothers all alive that long ago date in 1961. That memory had been repeated when I had visited the plot with Brother Edwin. For my friends it seemed to be different. It seemed like all of the brothers had all died at the same time in one brutal and tragic sweep of death. I have written over three and a half year’s worth of blogs every day. A week ago in Texas my luck run out and I was unable to find a computer in the middle of a large ranch in South Texas. The fact is that the more you write the easier it becomes. Because it is easier it is also more fun. This one has been fun from the moment I ran into the burly man with the red ball cap and the dark sunglasses at the end of the stairs when I arrived at Austin/Bergstrom Airport on June 10. I went up to the man with the cap expecting to find wires attached to one of his ears (“Could he be an airport security guy?” I thought). I said to him, “You are the man.” His answer was, “Yes.” And that’s when my adventures with John Arnold, the man with the faded semper fidelis tattoo on his left wrist, all began. 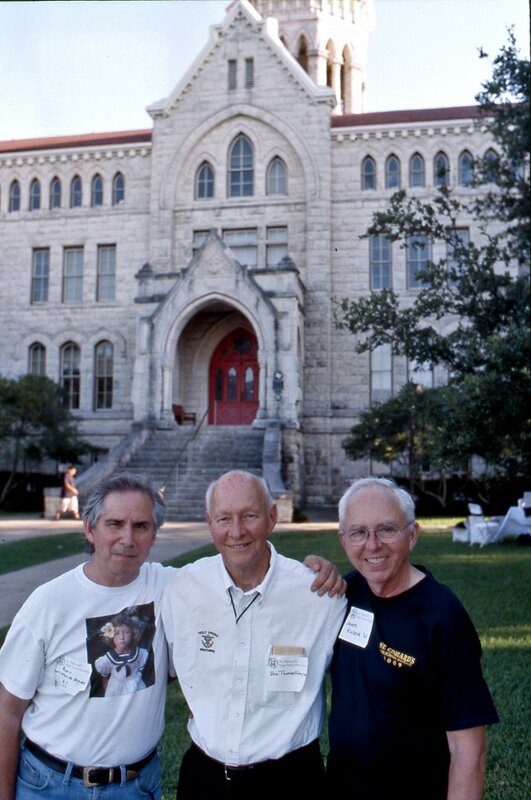 In 1960 at St Edward’s High School in Austin, Texas he had been one of three other of my roommates. In picture below, from left to right, that’s John Arnold, Mac Letscher, me and Melvin Medina. John chose to be my protector/bodyguard. I was a nerd but nobody ever bothered me that whole year. In 1985 I went to Houston and we had a small class reunion, one late evening, poolside, at a Holiday Inn. 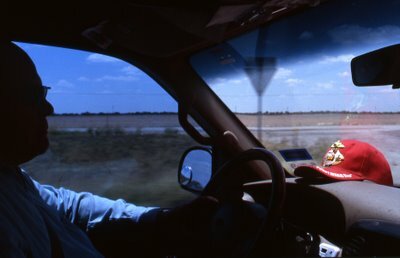 It was a typically humid and scorching Houston summer. Arnold in a perfectly ironed white button-down white shirt reminded me of Gerald Ford. He didn’t say much. To this day, Arnold’s wife Carolyn and his family will never attempt to wake him up from a deep sleep. Arnold, a US Marine Corps Vietnam veteran from 1965 still has nightmares. He can be a dangerous man not given time to wake up. To me there are two types of men. There are the ones who have been shot at and perhaps have shot back and killed. Arnold is an example. And then there are those like me who have not experienced that. There is a gulf there that can never be reconciled. Somewhere past San Antonio Arnold asked, “Are you comfortable with yourself?” I felt vulnerable and nervous about the question so I asked him to explain. In the next few hours we told each other secrets of our innermost soul. 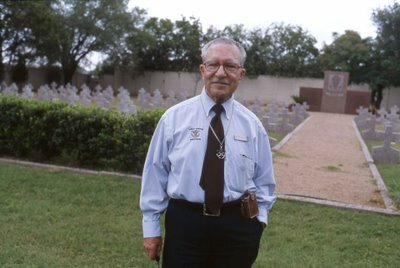 In my previous blog I wrote about Brother Thomas Frey, his smile and his acceptance of his life as it is. This confidence, while not illustrated by frequent smiles I saw in Arnold. Arnold is no saint but he is at peace with his world and the world that surrounds him. I would not suggest that you mess with him but if you learn not to be intimidated by his stern demeanor and observe that he does indeed smile sometimes you might find in him a friend you will take to your grave. At our all-classes reunion two weeks ago at the former campus of St. Ed’s High School in Austin, Texas and now the campus of St. Edward’s University, I was chatting with my former classmate James Kulleck. He works for NASA in the Mars Rover Program. Even in 1961, when I last saw him, we all called him “The Brain”. We were having a pleasant exchange of information of our lives when this man, obviously a Brother of Holy Cross, sauntered by us with a smile that was like red to a bull. I could have sworn that such was the grace of his saunter that he may have been levitating. He stopped, introduced himself, “I am Brother Thomas Frey CSC how are you all?” His voice was quiet, melodious and his accent was not Texan. He looked at us straight on with that smile of his and I felt as if he was vacuuming my mind. I felt that no matter what I told him of myself he already knew. We chatted. He told us he had been in California for many years and that he had taught physics. He told us he lived on the other side of the campus at Brother Vincent Pieau Assisted Living Facility. It is where many of the elderly brothers who may be on wheelchairs or be physically impaired in other ways reside at St. Edward’s University. He told us that everybody always noticed his smile but also his receding hairline. He said all this with a soothing voice that made me think the man could have had a soaring career in a midnight FM radio station. 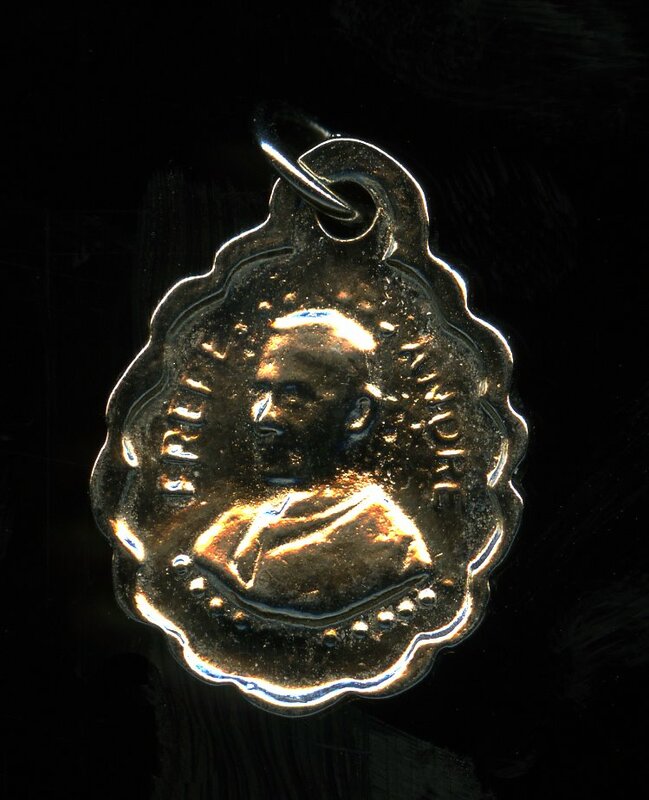 He then gave James Kulleck and me little metal medals. Luckily when I looked at them I knew that they were of Brother André, CSC who is perhaps, after the founder of the Congregation of the Holy Cross (priests, brothers and nuns), Blessed Father Basil Anthony-Marie Moreau, CSC in Le Mans in 1837, the most famous in CSC history. For me it had a nice connection with my life in Canada. 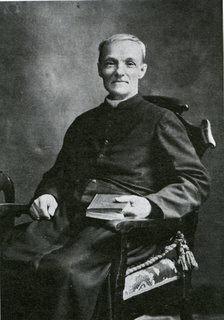 Blessed Brother André (a pre-sainthood in process appellation), in picture below right, was born Alfred Bessette in a town near Montreal in 1845. 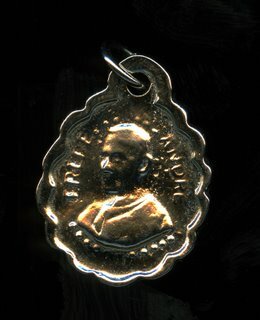 By the time he died in 1937 he was revered in French Canada and credited with thousands of miraculous healings. That very day when having lunch at St Joseph’s Hall with my former religion teacher and saxophone instructor, Brother Edwin Reggio, CSC I had picked up a little brochure on Brother André. I decided to see if Brother Thomas Frey could be challenged and lose his cool so I began, “Ah, yes! Brother André who was considered a quack by many.” Brother Thomas kept his smile as I told the story. At one time a woman in Montreal was dying of a blood hemorrhage and her husband was desperate. She instructed him to fetch Brother Andre. Her husband insisted that he would then be the laughingstock of the city when people found out he had summoned the man of the healing powers. When the woman got worse the man relented and went to Brother André’s residence and begged the man to accompany him back. Brother André calmly told the distraught man, “Go back to your wife. She is well now.” And so she was. Brother Thomas lingered for a while and then he walked off in the direction of Brother Vincent's. Could it have been the late afternoon sun which as a backlight gave the man a halo? I watched him until he disappeared. It would seem that both brothers are blessed but only one was blessed with more hair. Because you always spoke of your high regard for Gerry Gilbert and his work, I thought you might like to know, if you hadn't heard already, that Gerry died in St. Paul's Hospital last Friday at 6PM. Both his children Tamsin and Jeremy had paid recent visits, and Marlene Swidzinkski, a dear old friend was with him in his final hours. There's a short notice on our Schroedinger's Cat blog, plus photos. We will probably organize a memorial reading later in August. Gerry Gilbert was my favourite Canadian poet. 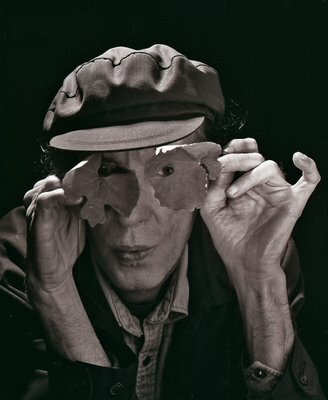 He helped me access poetry like no other poet has. I loved Gilbert because he always lived in poverty or close to poverty. He had his damned principles of which he never relaxed or let go. Gerry Gilbert taught me to laugh in tough times. When I first met Mike East back in 1959 at St. Ed’s High School, a Catholic boarding school in Austin, he was wearing a cowboy shirt, faded jeans, boots with spurs and a cowboy hat. Mike had blue eyes and one of them was slightly off so it was almost uncomfortable to look at him. He was very quiet and shy. When he spoke, his Spanish was far better than his English. 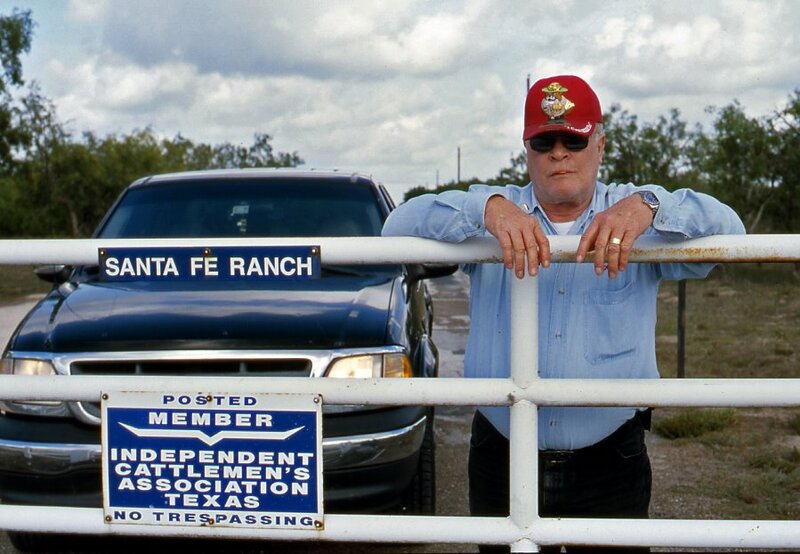 When I met him again at his South East Texas Santa Fe Ranch last week, Mike was still soft-spoken and shy. He was wearing beautiful spurs that had a comforting quiet jingle when he walked. 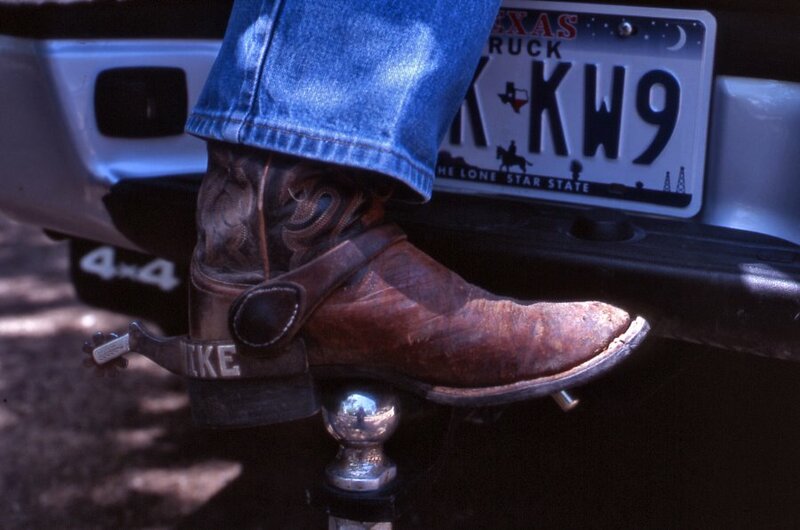 Mike denied that he had been wearing spurs that first time around. 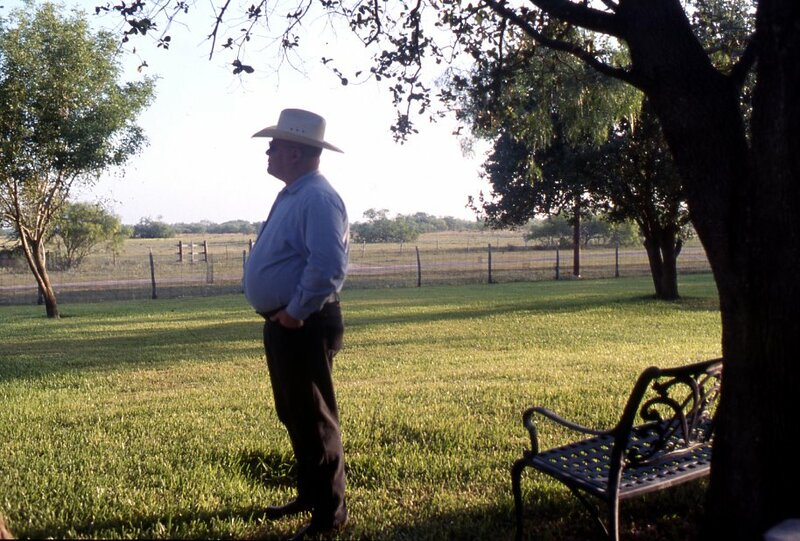 Watching the Patrón run his ranch was eye-opening for me and much more so in that we (my companion John Arnold and I were one year ahead of Mike) had the unusual invitation to visit and spend time with a most private man. We met his family, including his lovely companion Leticia who seemed to gently be the real behind-the-scenes patrón. Watching Mike lose his quiet cool (he baby-talked in Spanish) with his 15-month old grandson Quintun I saw a bond that rapidly alerted me to Mike’s fatherly qualities. Those very qualities are celebrated, appropriately, today. In a rare moment of candor Mike revealed that his father Tom had been very demanding with his only son. Mike had never received much credit for things done well but was constantly harangued by things done badly. I met Quintun’s father John and I noted how Mike treated him with gentle respect. I did not have to be told (Mike would have never mentioned it) how proud he was of his son. John will probably follow Mike’s footsteps. Mike’s other older son may not follow the family trade. When Mike told me this, he was neutral and hinted at no displeasure. Mike is giving his son room to find his own way. Any other father, including this one, would have lost his patience. Mike has that in spades and I am sure that the suffering inside would never rise to the surface. I watched Mike with Leticia. It is a gentle and warm relationship. Quintun absolutely loves her. Lucky for him Leticia’s Spanish is perfect. She speaks to him only in Spanish. Some day he just might be observed by some classmate. 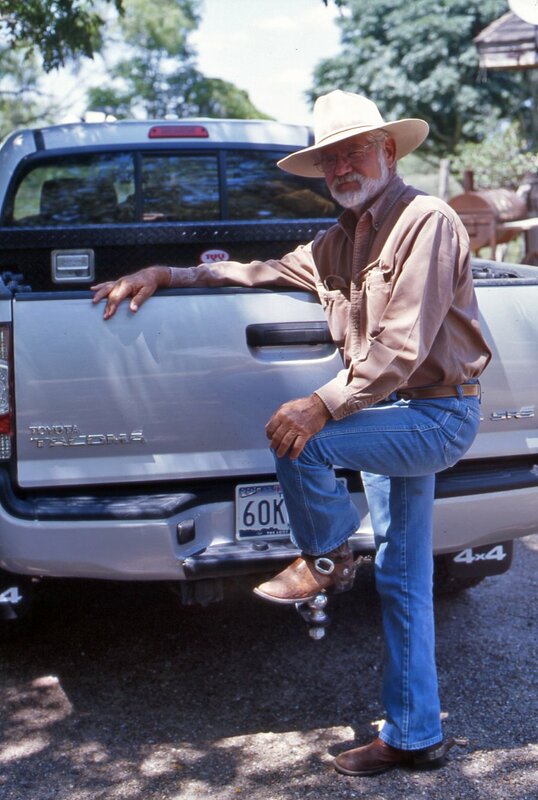 His classmate might note the spurs, the cowboy hat and shirt and the faded jeans. He might note that his Spanish is better than his English. Quintum will grow to be a gentle man because he will have the example of his father and grandfather. The Patrón and a future patrón, John East, on this day from this far side of the Rio Grande, to me look as perfect as fathers can be. Mike’s father Tom, lies in a burial ground-for-one, not far from Mike’s ranch house. 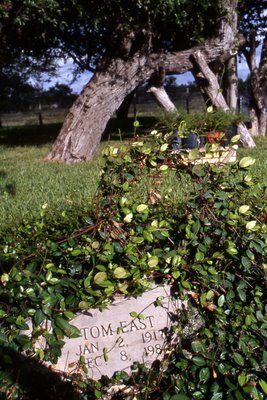 Tom East must surely be given some credit for making Mike the man, father and grandfather that he is today.